Toni Michelle Braxton-Lewis (born October 7, 1967 in Severn, Maryland) is an American R&B/adult contemporary singer, songwriter, and actress who was popular during the 1990s and the new millennium with hits like "Un-Break My Heart", "You're Makin' Me High", "He Wasn't Man Enough" and "Breathe Again". She has won six Grammy Awards. The RIAA named Braxton as one of the top selling R&B artists of all time. She first burst onto the scene in 1992 on the Boomerang Soundtrack, after Anita Baker turned down the opportunity. In 1993 Toni released her debut album simply titled, Toni Braxton. This album stayed at the top of the charts for a year and was a critically acclaimed album. Toni released her sophomore effort, Secrets in 1996 which also did very well on both R&B and Pop charts. From that album Toni got two #1 hits; You're Making Me High and Unbreak My Heart, which spent 14 consecutive weeks at #1 on the Billboard top 100, and was a worldwide hit. 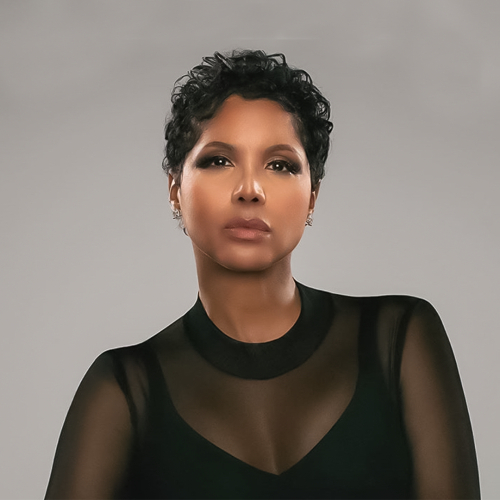 After 5 Grammy awards and a little break, Toni Braxton came back strong with her 2000 album, The Heat. Though not as successful as her first two albums, The Heat went on to sell 4million copies and spawned the huge hit He Wasn't Man Enough. Toni has released 2 further albums, 2002's More Than A Woman, and 2005's Libra. Toni is currently in the studio working on her forthcoming album "Pulse" which will be released this summer via Atlantic Records.